We all know what a strangler tree does. It starts out as a vine on a forest floor. Then it climbs high up a host tree and drops its roots down to the ground. As its roots thicken and multiply, the host tree is eventually strangled and rots away, leaving a hollow core around a convulated mass of roots. But in Baler Aurora, we found a story that didn't end there. We went to see the biggest living tree there, a strangler as well, but this one continued to drop new roots until it became a monster. They say at least 50 people holding hands are needed to circumnavigate its entire breadth. We found a group of children innocently playing nearby. Coupled with a stray shaft of sunlight, we found a composition worthy of the largest living thing in Baler. Enjoy. These are really great shots. 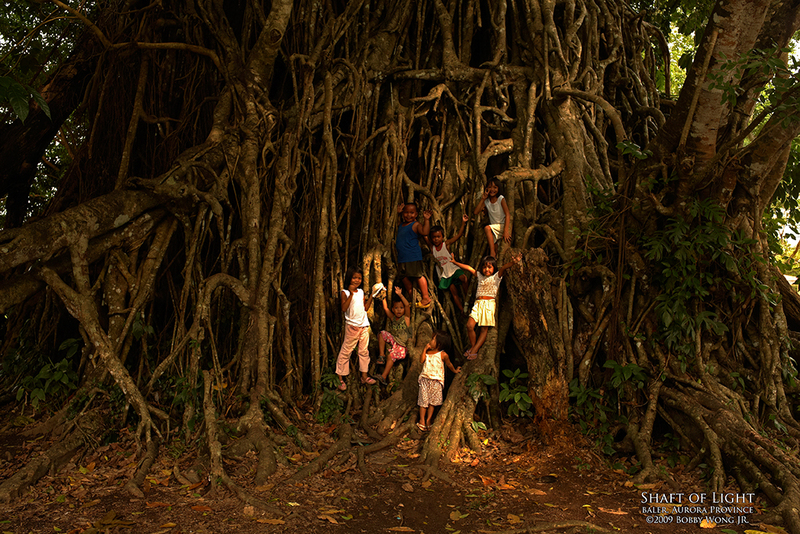 But this Balete Tree is actually not in Baler, but in Maria Aurora, Aurora Province. Ohmilord, your photos are absolutely gorgeous! Thank you so much for showing the Philippines in such a beautiful light! I will definitely spread news of your blog around. Again, thank you. Awesome. You captured the beauty of the Philippines, makes me envy you in a good way. The photo with the kids reminds me of my childhood, which was partly spent roaming in the wilderness. Thank you for sharing your works of art. Awesome photo. It breaths LIFE!